The ruins of Castle Toram on Loch Moidart. Loch Moidart is a sea loch and is, therefore, tidal and the island on which the castle stands may be reached on foot only at low tide. 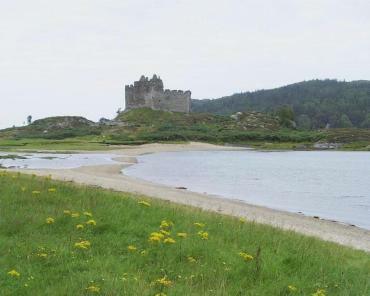 The castle was the seat of Clanranald for over 500 years and dates from the 14th century. There is a free car park nearby. This view is taken about 4 miles up the glen from the A861 looking back the way we came. 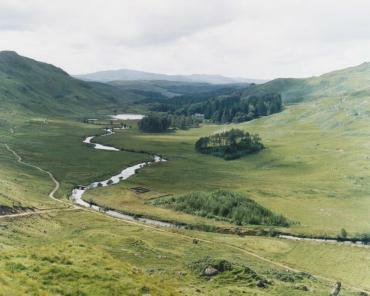 The wide footpath, which can be seen near the left edge of the picture, heads back towards the river and passes fairly close by the small loch seen in the distance by the trees. It is possible to drive part of the way (about 1.5 miles) and park down by the river less than a quarter mile after the road has crossed the river or continue on to the end of the public road, about another half mile, where there is space for several cars. 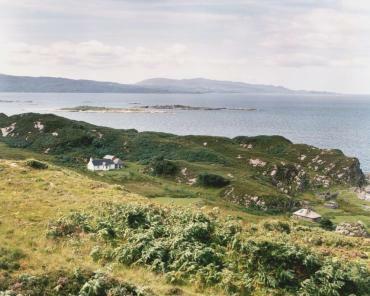 This view of the islands, those on the skyline, is from the Ardnamurchan peninsula. The island of Rum is frequently mis-spelled as 'Rhum'. 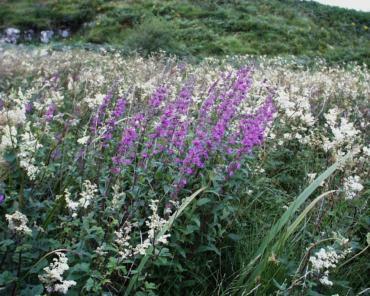 Eigg can be reached from Mallaig and, seasonally, from Arisaig. A small picturesque ancient village on the southern side of the Sound of Arisaig. The pronunciation is smi-ris-a-ry - 'smi' as in smith, 'ris' as in risk, 'a' as in at and 'ry' as in angry. I'm sorry but we only visit these places we don't think up the names! 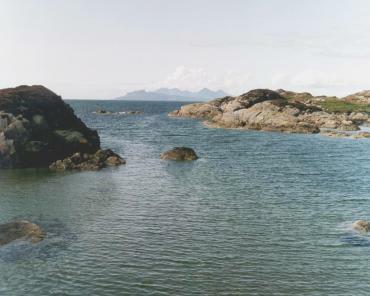 This shows the Ardnamurchan peninsula, the promontory in the distance, across the Sound of Arisaig.